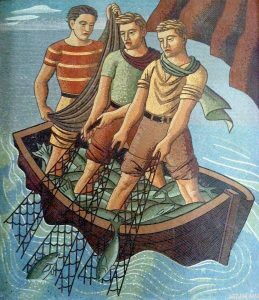 Denis O’Connor, Sue Hertel, and Studio MosaicArt di D.Colledani-Milan, mosaic, Savings of America, Springfield, Missouri, 1986. Note the goof that reversed the SH of Sue’s signature at bottom right. Mosaic is an ancient art. Around the Mediterranean, but especially in Italy, mosaic traditions go back millennia. And there was nothing obvious about Millard Sheets’s decision to include mosaics in his initial designs for Home Savings — though, along with stained glass, travertine, gold leaf, and classicist references in modernist designs — they contribute to Sheets’s goal of helping a new financial institution feel timeless, perhaps even eternal. Lillian Sizemore, a mosaicist and a scholar of mosaics, has helped me understand more about the unusual/innovative choices made over the decades by the Sheets Studio, primarily by Denis O’Connor, in the fabrication of the Home Savings mosaics. She and I have discussed how the Sheets Studio likely garnered its mosaic skills from Arthur and Jean Ames, who created New Deal-era mosaics at Newport Harbor Union High School, and taught technique to students (including Martha Menke Underwood and Nancy Colbath) at the Claremont Colleges. My research has suggested Millard Sheets first designed mosaics that were fabricated by the Ravenna Mosaic Company of St. Louis, in the 1930s and 1940s, before building his own fabrication team. And, like mosaicists around the world, the Sheets Studio ordered its best tiles from Italy (with some additional ones from Mexico), making it hard to use materials to track the mosaic fabrication process. What we see here is the other end of the spectrum — when, after Millard Sheets retired, Denis O’Connor and Sue Hertel continued the business — they became overwhelmed by the requirements of the rapidly expanding Savings of America. Lillian has helped me see how and where O’Connor ordered mosaics to be fabricated in Italy, at less cost, via a broker named Franco Merli at NOVA Designs. (Denis segregated the records about these Italian-fabricated mosaics, either as a matter of file management or to keep this change out of the spotlight.) The work was done by Studio MosaicArt di D.Colledani-Milan, which has a nice website highlighting their ongoing mosaic work. Offshoring the mosaic fabrication was cheaper, but, as Lillian has shown me, it also led to changes in the fabrication techniques, which she is tracking. 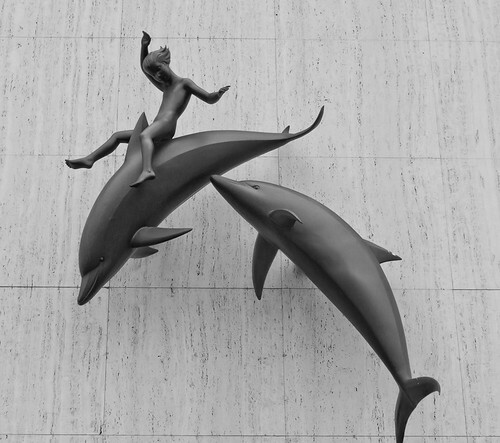 Unfamiliarity with the themes, figures, and even animals intended by the sketches lead to discussions, in a mix of Italian and English, in the files. This mosaic, in Springfield, Missouri, then suffered another goof — the fabricators did not correctly reverse Sue Hertel’s initials — and no one at the installation noticed to fix it. For one of the new national Savings of America branches, far from other branches and from the context and story of the Sheets Studio and Home Savings, this was insult to injury. One expects there were foreheads smacking from Missouri to California to Italy when the mistake was pointed out. On Monday, I had the opportunity to interview Larry Upham, who worked for nearly three decades on the construction of new Home Savings branches. (He even got his start, after Korean War service, in rock work at Millard Sheets’s Claremont studio via Arlen Eddington – and later did the same at Barking Rocks, in Gualala.) 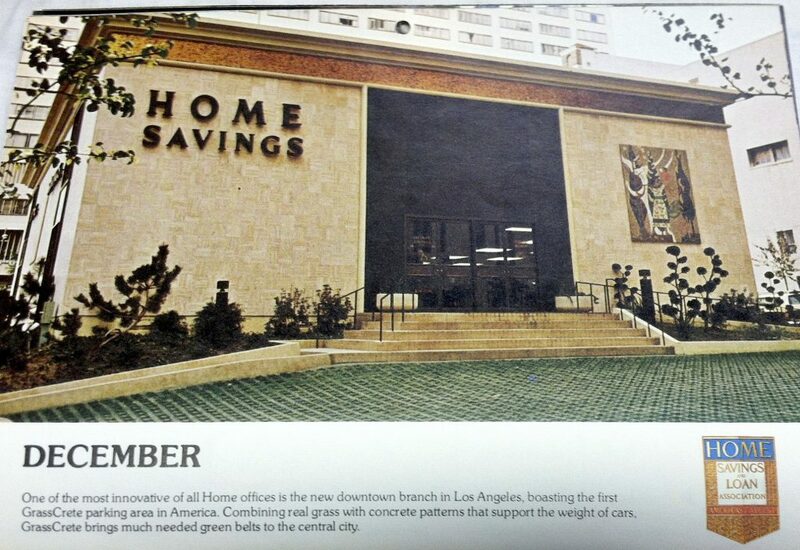 Upham’s career at Home Savings spanned the expansion throughout the LA Basin, on to San Diego and San Francisco, and then to other states, where Upham oversaw the construction of branches in Missouri and Illinois. He had an album of great photographs of these more farflung branches, where artwork was designed and fabricated under Denis O’Connor and Sue Hertel after Millard Sheets had retired from the Home Savings artworks. 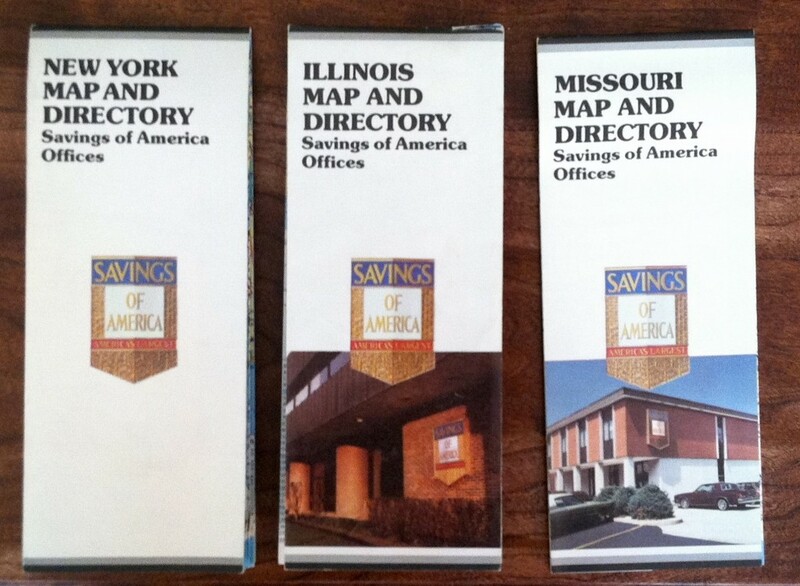 More of these to come — but today I will highlight something I had not seen: Home Savings road maps. As I mentioned in posts about Home Savings/Savings of America in New York, the bank had to introduce its traditions to a new audience across the nation, often doing so through its ongoing commitment to public artwork about a community and its history. The Auto Club of Southern California maintains great archives, demonstrating more than a century of reorienting Americans to the view from the driver’s seat. And a raft of great books describe the growth of roadside architecture. 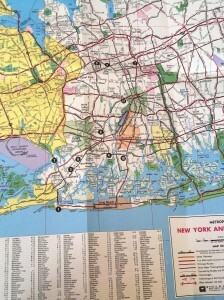 My scholarship on the art, architecture, and urban context of the Home Savings buildings will tell part of that story, of roadside postwar America — and these maps are just another reminder that Home Savings’s influences on the cultural, economic, and urban landscape were part of an intentional strategy. Here’s to another year of great contacts, interviews, new sources, and more writing — and, as always, I welcome your suggestions of people to speak with and sources to see. 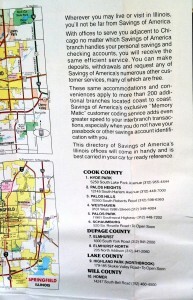 The Home Savings branches were expertly sited — placed on prominent corners, so drivers could know, instantly, which financial institution it was. 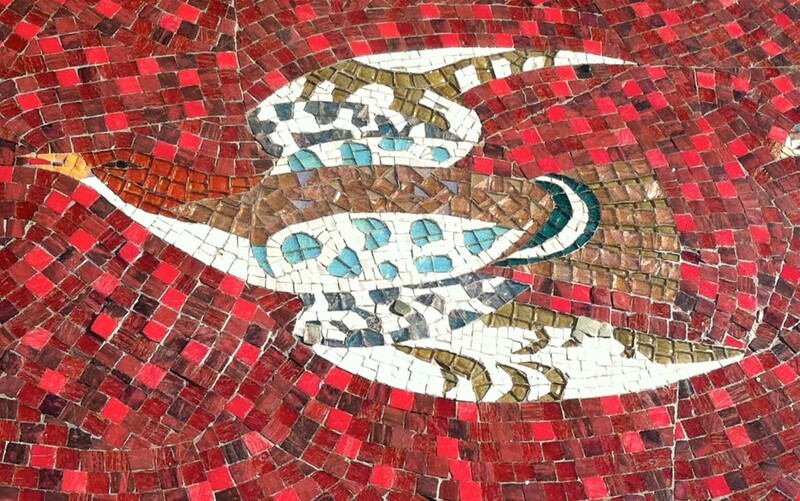 The original branches had gold tiles and brightly colored mosaics, like these birds. (The mosaic seems to involve less sophisticated cuts, and the location has no file in the Millard Sheets Papers, suggesting it was completed before 1961.) 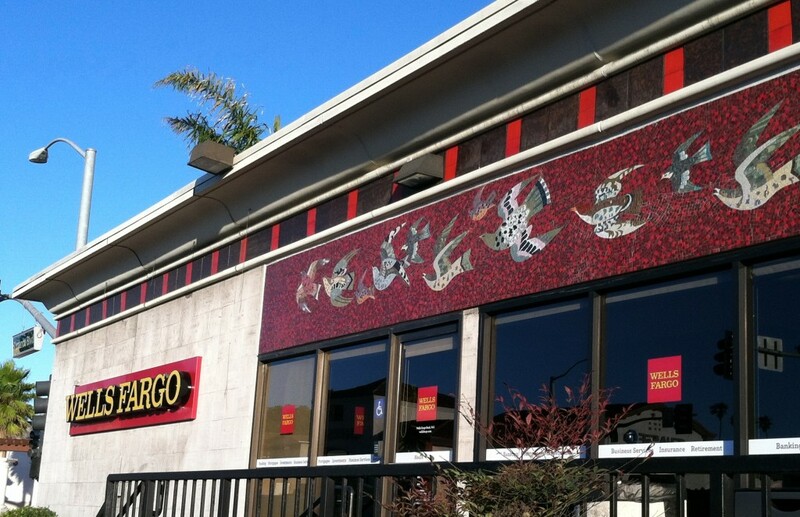 Funny to see the gold tiles replaced by the brown-and-red colors of Wells Fargo! Of course, other banks and savings and loans understood the value of a location on a prominent corner as well. The rounded-square signs over rounded-to-the-corner buildings mark the former Crocker National Bank locations. Even though Crocker was acquired by Wells Fargo, I find that many of their former locations in Los Angeles are now Bank of America, a result of the waves of bank expansion and consolidation that have shaped banking since the 1980s. This is a similar story: though Wells Fargo also owned the American Trust Company, and hence has a connection to other Sheets Studio artwork, I think this location is the only former Home Savings that is now a Wells Fargo, and the only location with artwork completed before 1980 that is a financial institution other than JP Morgan Chase. 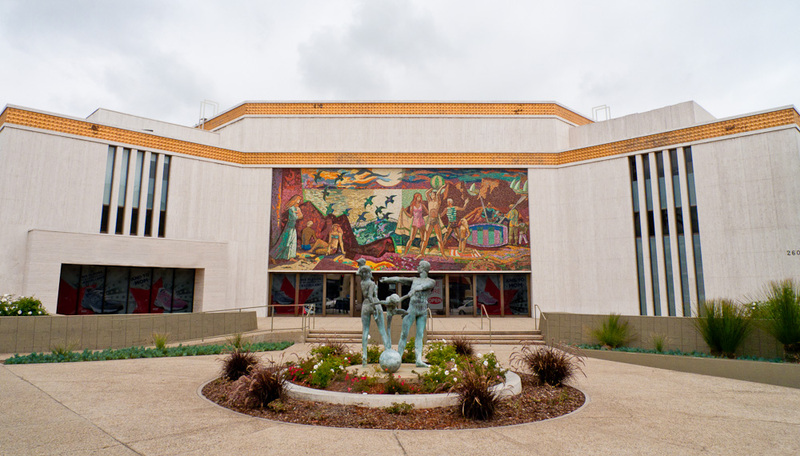 Louis Macouillard (design) Alphonso Pardinas – Byzantine Mosaics (fabrication), Bank of America Mosaic in San Mateo. Photograph by Franco Folini, 2010, via Flickr. I assume Wells Fargo and Bank of America had internal conversations about the Home Savings commitment to art, history, and community, and whether their banks needed to do similar work to compete — the San Mateo branch of Bank of America honors the bank’s founder, A. P. Giannini, with a front facade covered in mosaic designed by Louis Macouillard. But, despite their more public archives, I have yet to hear about records of these conversations. If you know of any, do let me know! Happy Holidays! The blog will return with new posts in January. As promised, I am back this week with another case of Sheets Studio work covered to protect it. The Burbank zoo mural is supposedly encased for its protection, and the Long Beach Home Savings mosaic is painted over, so still there but hiding. Now the treatment comes to stained glass, at the Santa Monica Wilshire location. Now, windows are for light, so a walled-in solution would not work well (and would have to be applied on two sides, which would get messy). But what if the new business does not think a joyous Sue Hertel / John Wallis creation, described in the Sheets Papers as “a continuation of the theme…pleasures of swimming, beach games, figrues with animals, all designed to to give a kaleidoscope of beach activity,” will fit the mood of the stores, or seem dated? 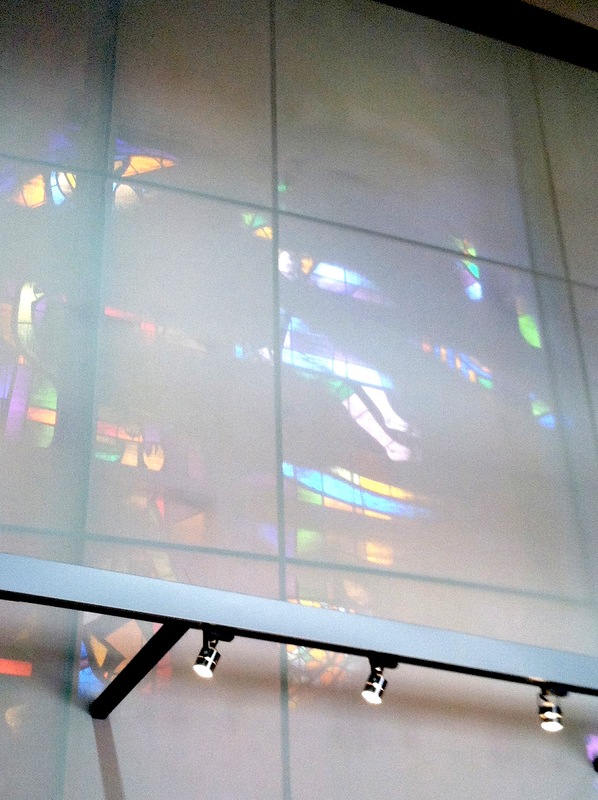 The translucent screen seems like an intriguing idea, bringing in that multicolored light while hiding (but not damaging) the stained glass behind it. But, to me, it just begs for the viewer to peek back there and say what are they hiding, anyway? It just sends more people to the parking lot, to consider it from behind. Sue Hertel and John Wallis Stained Glass, Santa Monica, 1970. Photograph by Peter Leonard, 2011, used with permission. Come back next week for the last post of the year — another case of Sheets Studio Home Savings artwork re-imagined for a new owner. When discussing the mosaic panels once at 7th and Figueroa, I thought of this image, of the Grasscrete parking surface once used at this location. (It also confirms the mosaic’s placement at that site, before removal.) A colleague at the L.A. Conservancy said this was her strongest memory of visiting this branch in the 1970s and 1980s. GrassCrete seems to be the brainchild of the Bomanite corporation, one of their ways to create “ornamented concrete.” Boman was an artist turned industrial contractor — clearly, a career path Millard Sheets would have admired. The number of marketers and technical papers online suggest it is still possible to order and install GrassCrete, which I have encountered, here and there, in public plazas. One wonders why (cost? impracticalities? mud?) this simple way of greening parking lots and sidewalks did not catch on. S. David Underwood & Millard Sheets Studio, Fred L. Roberts Enterprises-Bay Area Finance, Wilshire Boulevard, Santa Monica, built 1957, photo 2012. To continue looking at the work of S. David Underwood as principal architect for the Sheets Studio, I present these buildings, built (and unbuilt?) for financial institutions other than Home Savings. 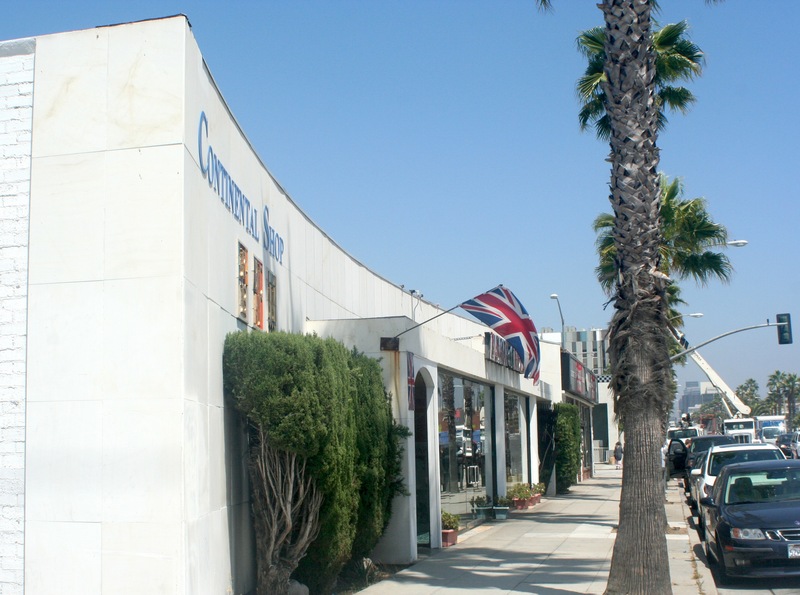 First, the built: a delicately curving building at 1619–1621 Wilshire Boulevard in Santa Monica. The color logo tiles and the terrazzo floors being the best hints at this building’s Mid-Century Modern past — given that the inside spaces were long since gutted. Note also the alley-side view in the picture above: for a building not on a prominent corner, the marble siding stopped when the facade did. Sheets Studio, logos for Fred L. Roberts Enterprises and Bay Area Finance and “JI,” Santa Monica, built 1957, photo 2012. The tile logo letters show an attempt, contemporaneous to the Home Savings work, to find a quick, recognizable way to mark the business with a colorful, artistic icon — closer to the style of abstracted corporate icons for franchise recognizability that has become a permanent part of U.S. roadside architecture, from the Golden Arches to the Swoosh to JP Morgan Chase’s interlocked pipes-become-octagon. S. David Underwood, sketch for First Federal Savings and Loan, n.d., S. David Underwood Archive. 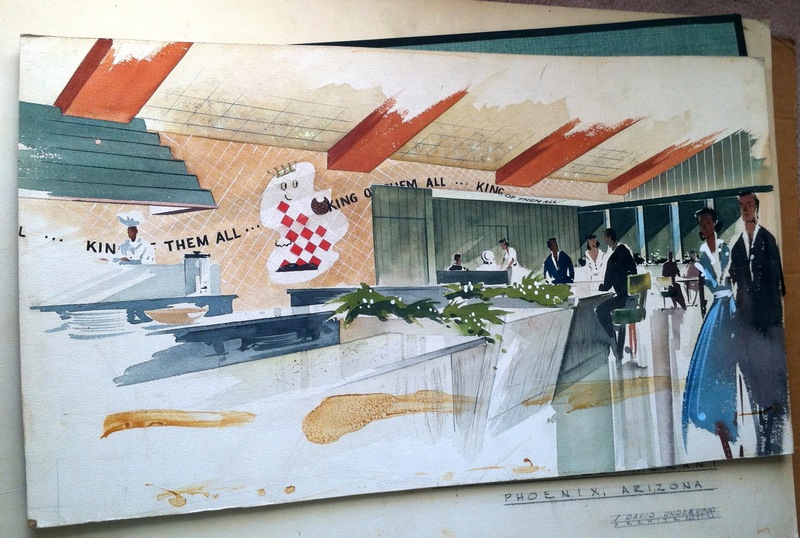 These works show that, while the art and architecture being created for Home Savings was the most prominent and memorable of the Sheets Studio work, those other projects, designed by Sheets and Underwood and completed by others in the Studio, demonstrate the wider role of their architecture in shaping the Mid-Century Modern look of commercial spaces, in Los Angeles and beyond. We can hope these contributions will be included in the exhibits, lectures, and discussions around the Getty’s Los Angeles Architecture initiative next spring. 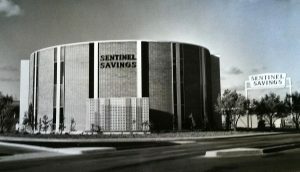 S. David Underwood, Sentinel Savings and Loan, San Diego, 1962 (demolished); photograph by Busco-Nestor Studios. S. David Underwood Archive. In July 1948, Millard Sheets typed up a followup note to Jack Beardwood, a TIME bureau chief and Millard’s connection to LIFE magazine. “It just occurred to me,” he wrote, ” it might be wise to suggest…that the magazine should not use the word ‘architect’ in the article in connection with my name.” As Sheets noted, “not having an actual architectural degree, along with many others who design,” he had no need to claim the title and “wav[e] a red flag in front of the A.I.A.,” architecture’s national professional association. Sheets made clear that he did the overall design, approaching it as art in its totality–but that there was always an architect there to sign off, to make working drawings, and to see to it that regulations were followed. 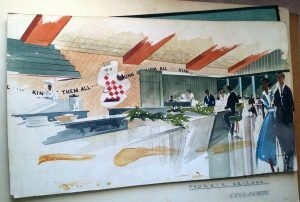 In the letter from 1948, Sheets mentioned Benjamin H. Anderson as the architect of record on the air school projects; as we have discussed here, Rufus Turner has shared memories of the studio beginning in the late 1950s. But, as soon as there was a Sheets Studio to be part of, the studio’s principal architect was S. David Underwood. Rufus Turner has memories of seeing Underwood hard at work in Sheets’s large personal studio at the Padua Hills house–and even of Underwood having a cot there to sleep, before the Foothill Boulevard studio was constructed, after a 1958 groundbreaking. 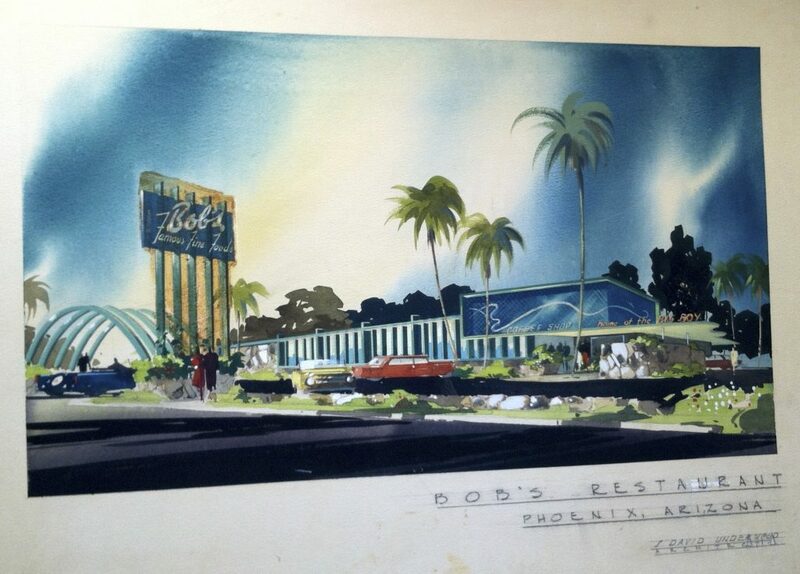 Born in Montreal in 1917, Underwood had grown up in Glendale, California, and his first commercial architecture was for a schoolmate, Robert C. Wian, designing distinctive, “landmark” architecture for the new branches of his hamburger stand, Bob’s Big Boy. This iconic work (see next week’s post) stood out among roadside architecture, much as Sheets would need for Home Savings. 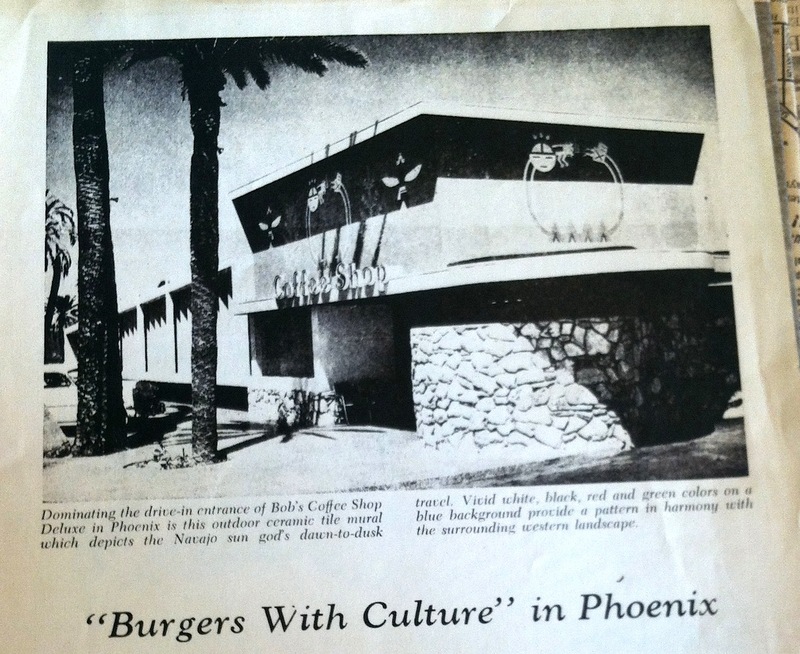 Underwood came to work with Sheets in 1955, just as Sheets’s work in murals and interior design was blossoming into the design of complete buildings, with the mainstay of the office’s work, at the behest of Howard Ahmanson, begun with a phone call in 1953, for both Home Savings (Underwood worked on 16 locations, 1956-1962) and Guaranty Savings and Loan (three locations, including Redwood City) in the San Francisco Bay Area. Underwood made all this work possible, Sheets understood. Millard wanted to sketch the silhouette of the building and design its artistic flourishes, but he wanted someone else to decide how to route the pipes, support the roof, or create drawings for permits and contractors. This synergy of vision and technical details was all necessary for the art to emerge–and the next few weeks will highlight these designs, from subtle to spectacular. Like the work of Sue Hertel, Denis O’Connor, David’s wife Martha Menke Underwood (married in 1962, they divorced in 1979) and others in the Sheets Studio, Dave Underwood’s work was publicly regarded as Millard Sheets Studio work, without much room for individual credit. 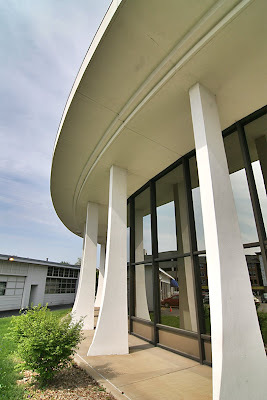 By 1962, Underwood left the studio to set up his own architectural office in Claremont, though he continued to collaborate with Millard Sheets on some projects, including the Garrison Theater (updated link here). 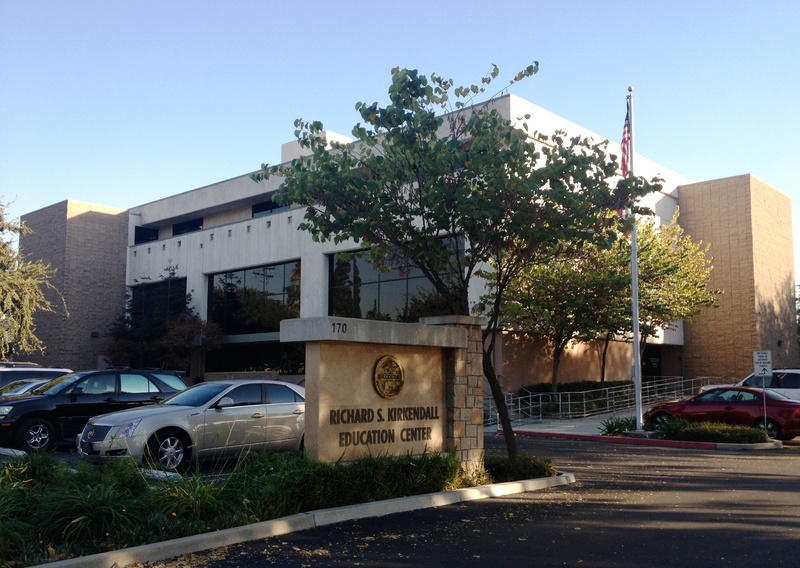 Underwood continued to design buildings, including a lot of distinctive office space in Claremont, including the San Jose Avenue office building for the Carpenters’ Union (updated link here), and the Midland Mutual Insurance building at Harvard and Fourth, until his retirement in 1990. Underwood died in 2002. As all the references above suggest, there are a lot of buildings I could have chosen to introduce Underwood on the blog. But one stood out–because it was a memorable landmark of my childhood. S. David Underwood, Sentinel Savings and Loan, San Diego, 1962 (demolished); S. David Underwood Archive. 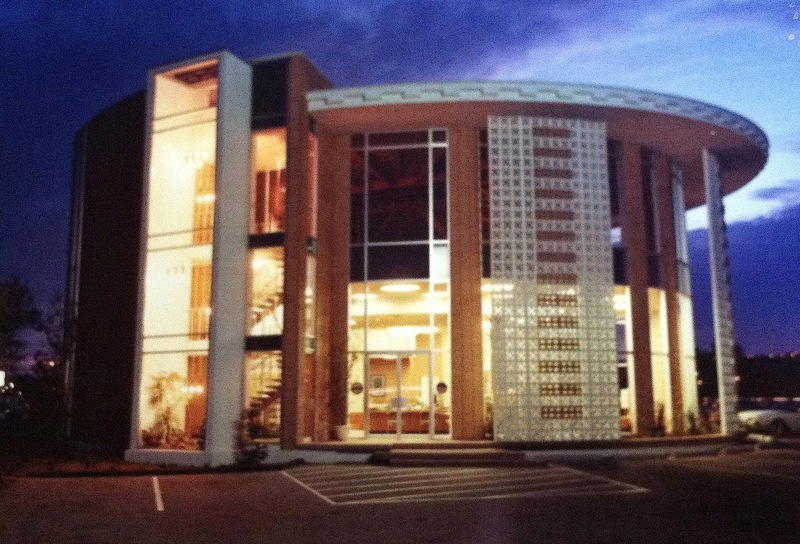 The Sentinel Savings and Loan building was built on Camino del Rio North in San Diego, near the intersection of Interstates 8 and 805 was constructed in 1962, one of Underwood’s first projects to be listed under his own architectural firm, after his time with the Sheets Studio. 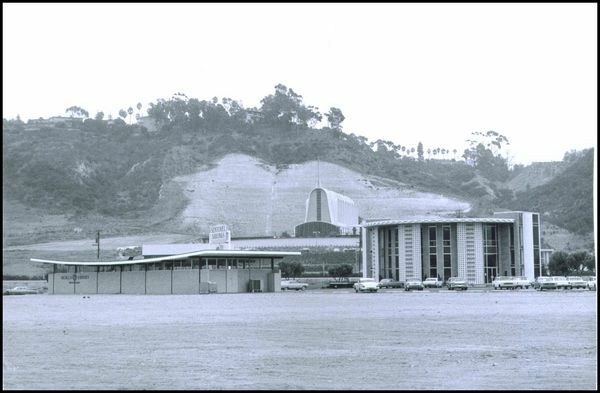 As this photograph demonstrates, by 1965 the Sentinel Savings building anchored a trio of distinctive modernist structures in Mission Valley. 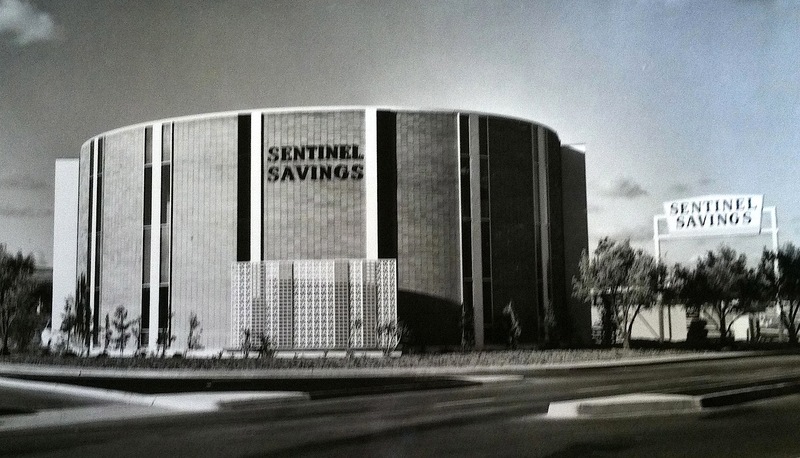 In 1971, Sentinel Savings was purchased by Great Western, the name on the building in my childhood. Of these three, now only the First United Methodist church remains. Come back over the next few weeks to see more examples of Underwood’s work, before, during, and after his Sheets Studio work. Thanks to Brian Worley, Rufus Turner, Steve Underwood, “Adrian Chapelo,” and Jane Kenealy of the San Diego History Center for their help with information for this post.